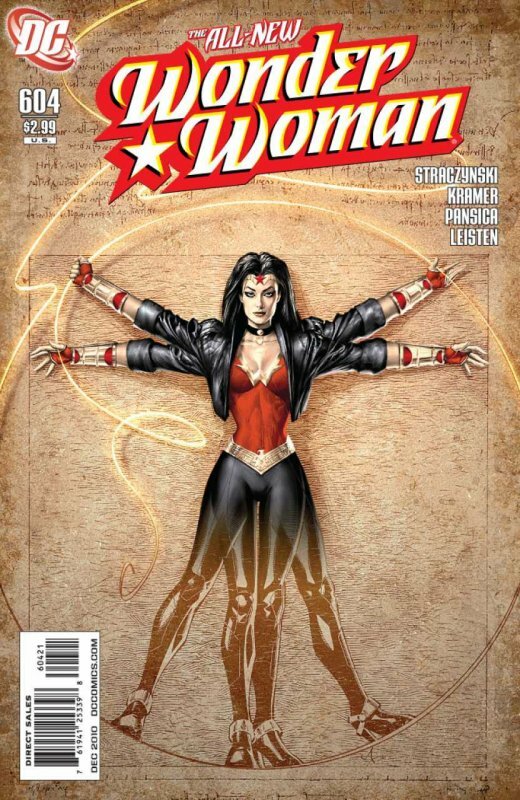 After the hype that had been generated following the announcement that Straczynski would be taking over two of DC Comics’ flagship characters, the industry and fans alike were stunned when, a few weeks after this issue came out and a notification that issue 605 would be late, DC announced that Straczynski would be leaving both the “Wonder Woman” and “Superman” titles to take up writing duties on a sequel to “Superman: Earth One”! 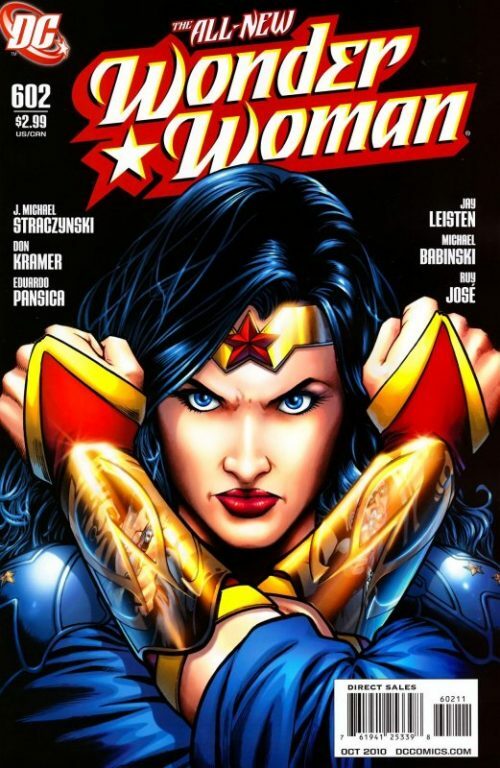 The graphic novel, which had met with critical and sales success when it came out, would be getting a fast tracked sequel and in order for him to focus all his creative energies on achieving another sales winner – Straczynski would, with immediate effect, be leaving the monthly books and in the case of “Wonder Woman”, handing over writing duties to Phil Hester, who would be continuing the Odyssey story arc based on Straczynski’s original story notes. Understandably, fans of both the affected titles were suspicious and had their own alternate views as to the real reasons behind the surprising and sudden departure of the writer, who had been trumpeted by DC as a major coup when he had moved from Marvel Comics, and who had been given free reign to write “groundbreaking” – and in the case of Diana – highly “controversial” year long story arcs for the two major DC characters. Some found it unbelievable that DC would consciously commit to let Straczynski write year long arcs for such important characters but then simply pull the rug out in search of a quick buck from a “Superman: Earth One” sequel. 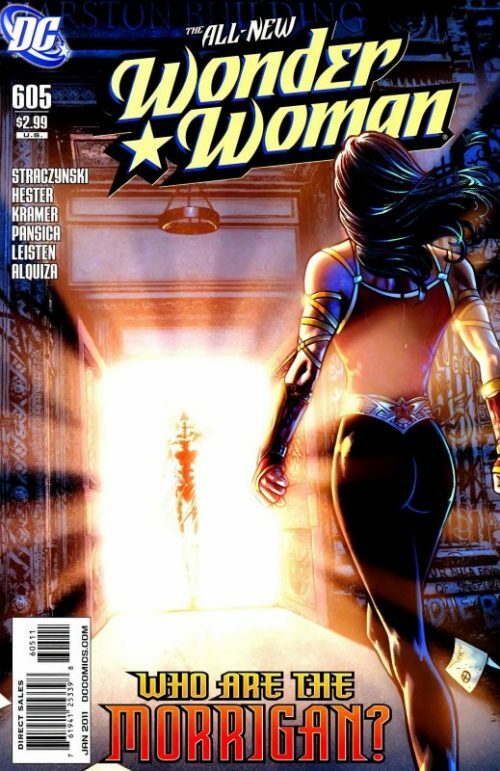 A few fans suspected that in fact, the abruptness of the change was more to do with the fact that the anticipated sales spikes for the titles had been lower than anticipated and in the case of “Wonder Woman”, the radical changes made to both the character’s origin and iconic costume had proven far too unpopular, not only with the core fan base but the wider general public at large, and that the writer and his direction had simply proven too toxic for such a major marketable corporate asset. An alternative theory put forward was that the writer no longer had any faith in monthly titles and saw the future of the industry as being in the graphic novel format, although Straczynski later gave interviews in which he refuted such claims. 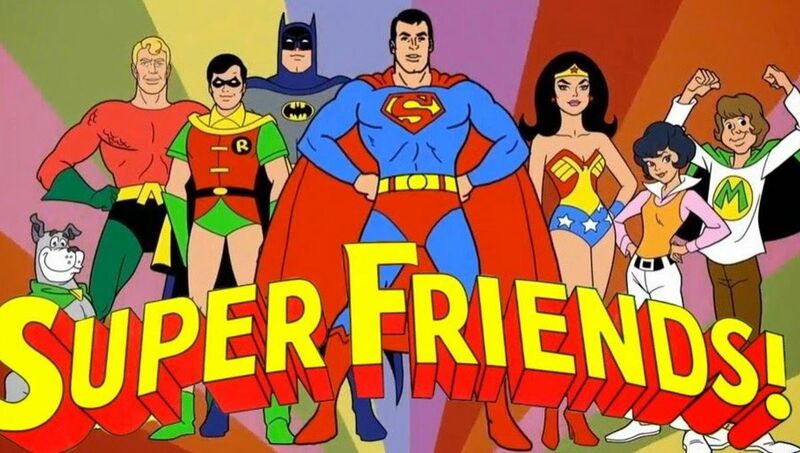 The official DC press releases stated that this change had been the plan all along – albeit somewhat accelerated – that this decision was a mutual one between both parties, and that the story arcs for the monthly titles would continue to their natural conclusions. 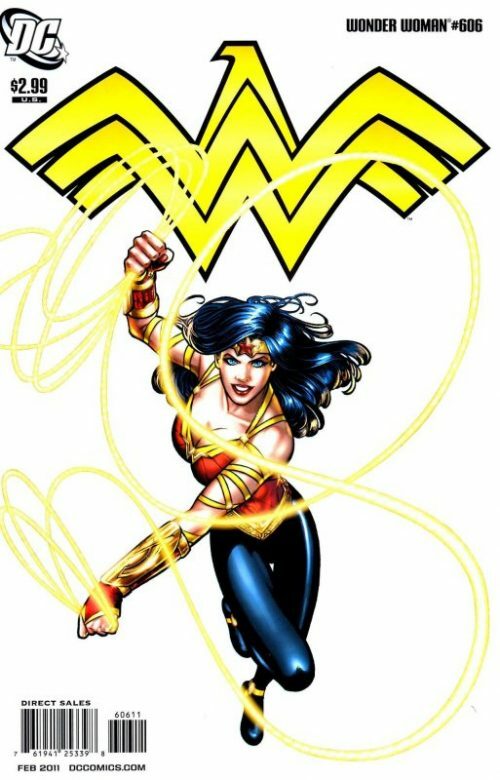 However, “Wonder Woman” fans in particular wondered if this would in fact result in a much speedier resolution to the Odyssey arc and would perhaps see a return of the classic costume and origin much sooner than hypothesized. 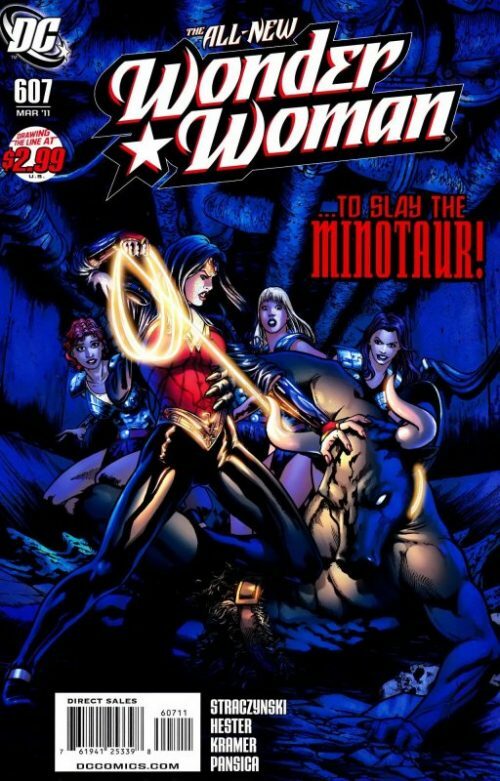 Encircled by flames, Diana squares off to the Leader responsible for hunting down her Amazon sisters. As he notices the image of her mother on the shield she is carrying and comments that it is fitting as she will soon be joining Hippolyta in death, she in turn asks why he wants her dead? He replies “I could say because the nail that sticks up gets hammered down or because it’s the natural order of things for the strong to prey on the weak.” As well as the fact that he is simply following orders. And he is also very good at what he does. He used to work for the government – several governments in fact – because his skills involved torture and death which are often instruments required by authorities to meets their nefarious goals. He went wherever the money was – with no conscience or compassion – just simply killing and maiming as if it was nothing more than a day job. But although he was able to execute such horrors – it was not something he could take credit for. And so the truth went to the graves of his victims and as long as the governments he had worked for remained stable his secrets stayed safe. But the last government he had worked for did not remain in power as long as he would have liked and before he was able to make his exit. His position became compromised and in the chaos of the coup he had tried to make a run for it before the angry rebels had caught up with him. But they did. Binding his hands behind his back and forcing him to kneel on the ground as they surrounded him, they had told him that at first it was their intention to turn him over to a court so he could be judged by his peers for his heinous crimes. But a monster such as he had no peers. And any justice should be metered out by those families who had lost loved ones at his hands. With that, the mob had gone to work on him. He thought he knew every kind of horror that could be inflicted upon a human being but he had discovered he was wrong. And when they had finished, they finally poured petrol over him and with a simple match had condemned him to a fiery death as he was burned alive. The crowds had simply walked away to leave him to burn to cinders and as he felt his life ebbing away he had heard a female voice. She spoke to him and told him he was not alone. She continued to say that she had need of a man such as he to eliminate all traces of those who would oppose her intentions. She had asked him to swear fealty to her and she would let him escape the flames and live- but only as a charred corpse. He would remain this way until the last of the Amazons was dead and on that day – he would be restored to his former self! He of course agreed to the bargain and the deed was sealed. And now here he is to fulfil his side of the bargain. He tells Diana that she and the last few Amazons left alive are all that stands between him and salvation. He then asks her if she has anything to say having heard his story. She calmly replies. “No”. With that, she launches herself at him – shield and sword at the ready – and combat commences! In their fiery arena, the two combatants hold nothing back as each is determined to slay the other. They both take their blows and sustain their injuries and the fighting is evenly matched. As Diana punches the Leader hard again on the chin causing blood to spray from his mouth, she cries out that she does not want to hear his story, or who is he or where he comes from. She also does not care if she dies right here and now! All that matters is that she takes him with her! He responds however with a powerful blow that sends her flying, blood spraying from her own mouth. As she attempts to get to her feet still dazed, he stands over her with the lasso. He states that the golden rope had belonged to her mother. He had reclaimed it from the fire that took her life. He thought Diana might appreciate the symbolism. As he forms it into a noose he continues to muse how fitting it will be that Hippolyta’s daughter, maddened by grief and consumed by rage and a need for revenge, is caught in the same loop that killed her mother…reaching across the grave to trap Diana as she herself was trapped. “You want it? Come and get it.” he snarls. A furious Diana gets back to her feet and attacks once again. 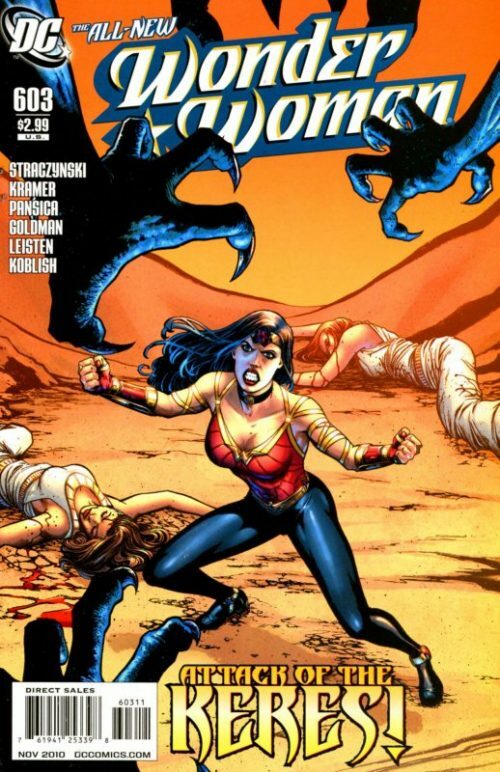 The battle is even fiercer than before and the Amazon uses all of her combat skills to keep her opponent at bay. As she strikes him hard he momentarily loses his footing and falls into the flames. He cries out but recovers quickly and before Diana can react he races around behind her and loops the lasso around her neck, pulling it tight! He sneers that she will soon feel the power of the lasso binding her will to his. She can struggle all she likes but in moments she will be compelled not to escape. As she tries to breathe, she responds that she does not want to escape. He assumes that the lasso is already compelling her but she continues to snarl that he is in truth afraid of the fire and that it hurtshim. He had not gone into the flames to stop her mother when she had killed herself. And he in fact uses fire to frighten others and distract them from knowing that he himself is afraid of the flames. Diana then grabs the rope and pulls him towards her before wrapping her arms around him and hurling the two of them into the raging flames! Her foe screams in agony and desperately tells her that the fire is magical and that they will both die. “Then we both die” she coldly replies. But as the flames close in around them she hears a voice and turns to see an image of her mother in the flames. Hippolyta tells her stunned daughter that if she dies here tonight her soul will be consumed by fire…by vengeance..by hatred…and all that she has fought for will die with it. The enemy is greater than this…but the hope Diana carries is greater still. She must live. She must. As tears roll down Diana’s face, she replies that if she let’s go her foe will escape. 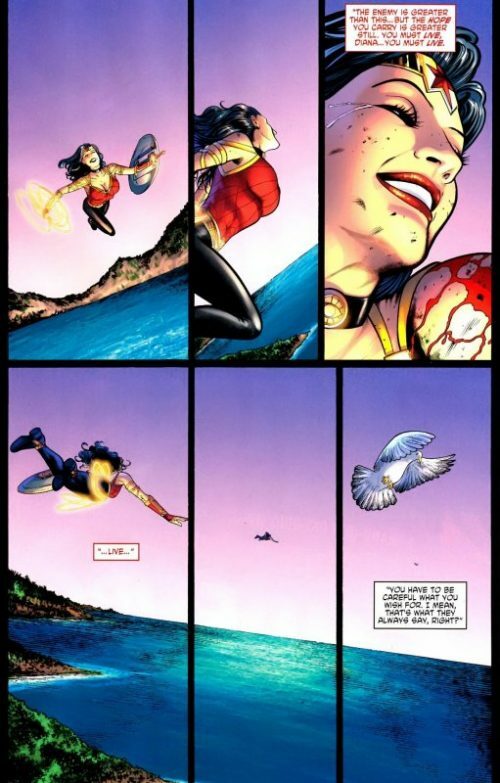 Hippolyta replies that she did not tell her to let him go. 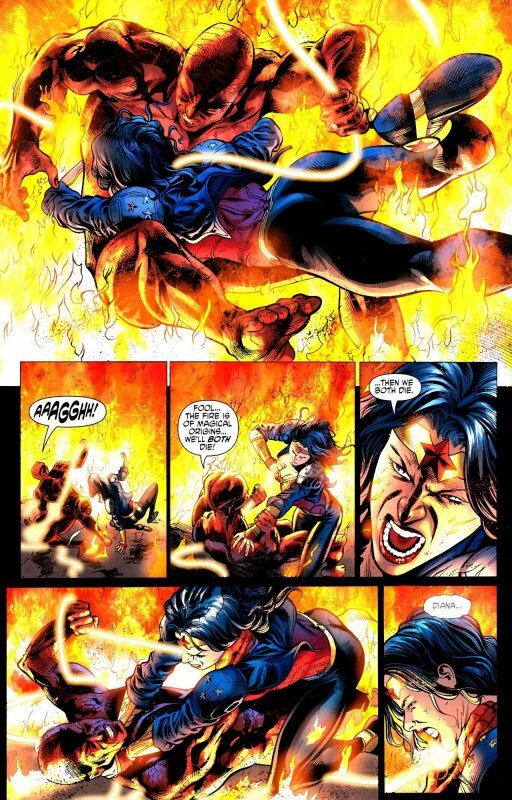 With that, Hippolyta emerges from the flames with a burning sword in her hands and says “Leave him to me! 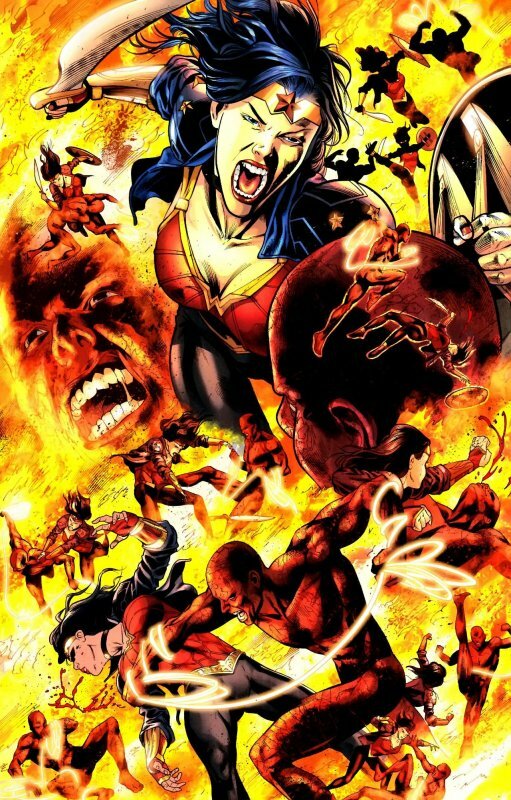 That I might finish what we began!” As Diana rolls away Hippolyta stands over the horrified Leader as she declares “Into the flames you cast me…in the flames I have awaited…and from the flames I return!” With that, she plunges the flaming sword into his heart. She tells Diana to escape the inferno before it’s too late. Hippolyta turns her attention back to the squirming Leader beneath her and tells him that their souls will war forever in the flames – but whereas she will rejoice in their embrace he will burn for eternity! A few hours later Diana comes to and finds that the fires have burned themselves out. 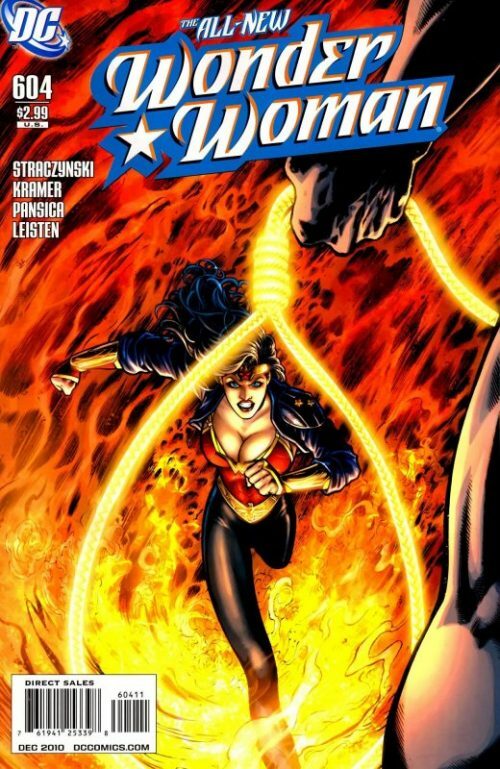 She sees the lasso lying on the floor and as she removes the tattered remains of her burnt jacket and discards it, she picks up the glowing golden lasso and heads towards where the Leader’s plane is waiting for his return. The pilots see her approaching and realising that she has vanquished their master, panic and begin take off. She breaks into a sprint determined not to let them depart and tries to hook her lasso around the tail fin – but misses by inches. Determined not to give up, she increases her speed and suddenly finds her feet are no longer touching the ground!